Tropical Slide with a Steep Slope! This 18ft. 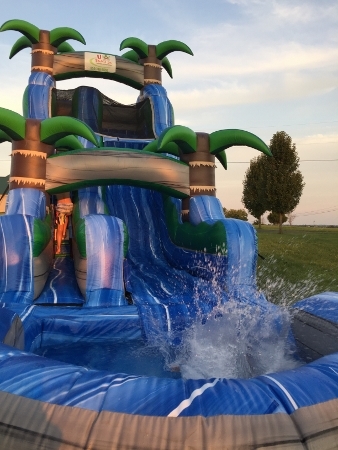 Blue Crush water slide with pool is an perfect for your backyard birthday party or corporate event! It features a tropical themed 3D environment that your guests will love, along with rich vibrant tropical colors that will turn your event into a water resort. Climb the inflatable slide on the left of the unit, with easy grip hand holds and easy climb steps. Guests, sit down and get ready to get soaked, as they whiz through the mist, down the slide into the inflatable pool below. Parents can view their kids from one location as the slide features all the action of climbing and sliding in the front. Rent the 18ft. 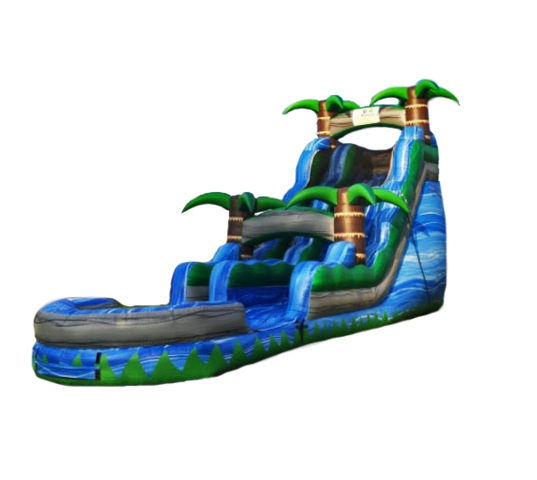 Blue Crush Water Slide with pool to keep your guests refreshed and entertained!